Publishing research using ab52968? Please let us know so that we can cite the reference in this datasheet. Carr AJ et al. Molecular characterization and functional analysis of phagocytosis by human embryonic stem cell-derived RPE cells using a novel human retinal assay. Mol Vis 15:283-95 (2009). WB. p.285 To examine the role of MERTK in phagocytosis, we incubated HESC-RPE cells with rabbit monoclonal antibody to 1:40 MERTK or 1:40 control rabbit IgG (both Abcam, Cambridge, UK) for 1 h.
Kindly advise the catalog no. of this isotype control. 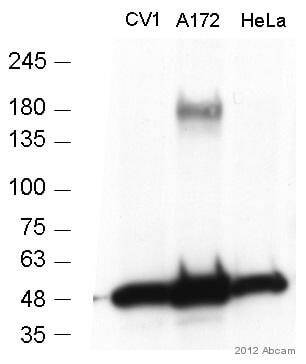 Unfortunately, in few cases we cannot find the connection between the antibody used in a publication and the antibody used in our catalog, especially as we are trying to link this kind of information to the datasheets. I can now confirm that the concentration of the anti-MERTK antibody [Y323] (ab52968), of the lot number GR54920-5 is 0.1180 mg/ml. Thank you for contacting us and sorry for the delay of our reply. > "Sorry for the delay in response. As stated previously, the anti-MERTK antibody ab52968 displayed clear membranous and some cytoplasmic IHC staining of human lymphoma tissue. > Yes, it is true despite the region of the immunogen. > The image is from formalin-fixed paraffin-embedded tissue, and we performed in-house testing. > Although we do not have a paper for IHC, the antibody's specificity is demonstrated in WB and IF. > Unfortunately, that is all the information we could find." I appreciate the time you have spent on these experiments and would be pleased to arrange, if you agree, a replacement in compensation. The lot we currently have in stock is GR54920. Let me know if you received a different lot so I could send this one to you. Also, could you please inform me when the antibody was ordered and if it was ordered via a distributor? We would like to investigate this issue much further, so could you please provide some information about your protocol by filling in the attached questionnaire? I look forward to your reply and I hope this case will be resolved as quickly as possible. I just wanted to let you know that we are still waiting for a reply from the originator of this product. I have sent a reminder and I hope we will receive the details about the IHC image you requested in the very near future. I am working with abcam Antibody ab52968 (for Mertk). Looking at image reported in your data sheet regarding IHC result, I can see a staining that not appear to be membranous as expected. Can you explain me the result? Thank you for contacting us. I apologise for the waiting. Anti-MERTK antibody [Y323] (ab52968) displayed clear membranous and some cytoplasmic IHC staining of human lymphoma tissue (see larger image attached). The Human Protein Atlas states “Most normal tissues showed moderate to strong cytoplasmic positivity with a granular pattern” (see image from the link below). I also found another example of MER cytoplasmic staining in IHC (attached). I hope this information was helpful. Please do not hesitate to contact us back for further assistance. The datasheet for this product states that it recognizes both human and mouse however, all of the experimental data provided are performed with human tissues and cells. We need an antibody against mouse MerTK that has been shown to be successful for flow cytometry. 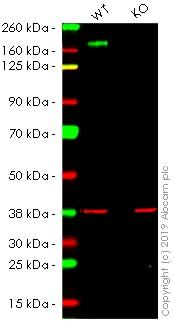 If we order this antibody (along with the recomended secondary needed for FC) and we are unsuccessful with mouse samples using flow cytometry, are there any quality assurances? Will you provide supplemental antibody or refund? We are a small laboratory, so we have to stretch our funds. I don't want an investment in this product to be a loss of both valuable time and research funds. Thank you for contacting Abcam. The antibody, ab52968, anti-MERTK antibody [Y323], is covered under our Abpromise, which means that if the antibody does not work as stated on the data sheet and if our support specialist cannot help resolve the issue, then we will provide you with a free of charge replacement or a refund. In this case it is guranteed to work in flow cytometry in mouse tissue. I hope this helps assure about our products and our guaranteed . If there is anything else I can do, please let me know.